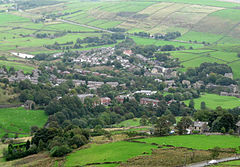 One of a number of picturesque locales stolen from Yorkshire in the ill-considered local government reorganizations of the 1970s (responsible for such creatures as ‘Cleveland’ ‘Humberside’ and worse), the West Riding village of Delph was long significant for its textile mills. The village centre has hardly changed from the 19th century, when it was a thriving centre of employment. In 1851 the railways arrived – part of the London and North Western Railway route from Oldham four miles away in a county called Lancashire. The etymology of Delph is derived from the Old English ‘Delf’ (a quarry), and just to the north of the village are the remains of quarries from which ‘Bakestones’ were cut: thick tiles used to bake oatcakes and muffins. This is part of the Making Music series, 2015-16. DeNOTE are Selected Artists for this season. The internationally-acclaimed digital iBook, The Mozart Project, for which DeNOTE filmed several excerpts in the ‘Concertos’ and ‘Chamber Music’ chapters, has won TWO major awards at the 2015 iBook Authors Conference held at Nashville Tenessee. The Mozart Project not only captured the Best Musical Work category, but also won the overall top prize, iBook of the Year! DeNOTE performed sections from the F Major Piano Concerto, K.413; the G minor Piano Quartet, K.478, and Freystaedtler’s arrangement of the Piano and Winds Quintet, K.452.